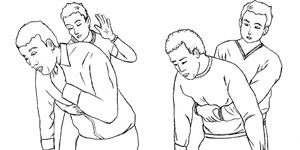 (P1) Henry Heimlich invented the Heimlich maneuver, which is a first-aid procedure. You press on a person’s abdomen to remove something from that person’s windpipe when he or she is choking. (P2) Doctor Heimlich is 96 years old now. He knows that his maneuver works, but he never used it – until now. He saved the life of a woman at the senior center in Ohio where they both live. (P3) The doctor said that saving the woman’s life was a wonderful feeling. Have you ever used the Heimlich maneuver on someone? If so, describe the situation. Can you explain how the maneuver is done? Are there senior centers in your country? If so, do you know anyone living in one? How old is the doctor now? Which State in the USA is the center located?